"If you like it then you should have put a ring on it". That song no longer applies to Amber Rose! BOOM, BOOM POW!!! Wiz announced it via his twitter, tweeting "She Said Yes!!!". 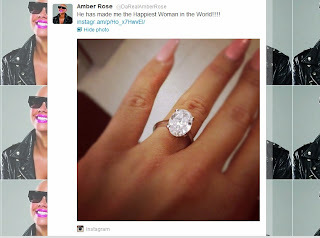 Awwww, and of course Amber took it to her twitter, tweeting "He has made me the Happiest Woman in the World!!!!". Also with a pic of the engagement ring attached to both tweets. Check out their tweets below and the ring. 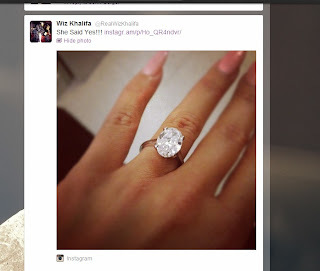 Congrats to both Wiz Khalifa and Amber Rose.